Cameron Diaz, it seems, is waiting to receive me at the lodge. But it’s Nadia. Then my hearts beats excitedly as it looks like Nadia is presenting me Warren Beatty. But it’s Nadia’s husband, Stefan, as attractive as Warren Beatty. Stefan and Nadia are the handsomest couple of GMs you’re likely to meet. Nadia flutters about prettily. Stefan’s exactitude ensures South Africa’s tautest service. Here’s one safari lodge that spares you shambolic service and where you don’t expostulate “TIA!” (“This is Africa!”), which is the standard explanation for all organisation disasters in Africa. As good-looking as Stefan and Nadia is Earth Lodge. It looks like a war bunker at first. Then, you descend into the earth, into a most original construction. On display before you is the wild splendour of Africa; boulders, waterholes and an entanglement of bush. Nature complements the creative imagination of African architects and designers who wedged out the earth to create this design marvel, and embellished it with extraordinary artwork and furniture made of driftwood from an inundation. Who says deadwood is a white elephant? Indeed, it impressed its worth when a visiting prince’s entourage, before departure, paraded out the in-suite furniture as the staff watched on aghast. Then Stefan, with his inimitable aplomb, offered the prince a bill. HRH read, HRH reeled. HRH had it explained to him that the invaluable furniture wasn’t included in the cost of the stay. The fantastic furniture was carried swiftly back to the fantastic suites. 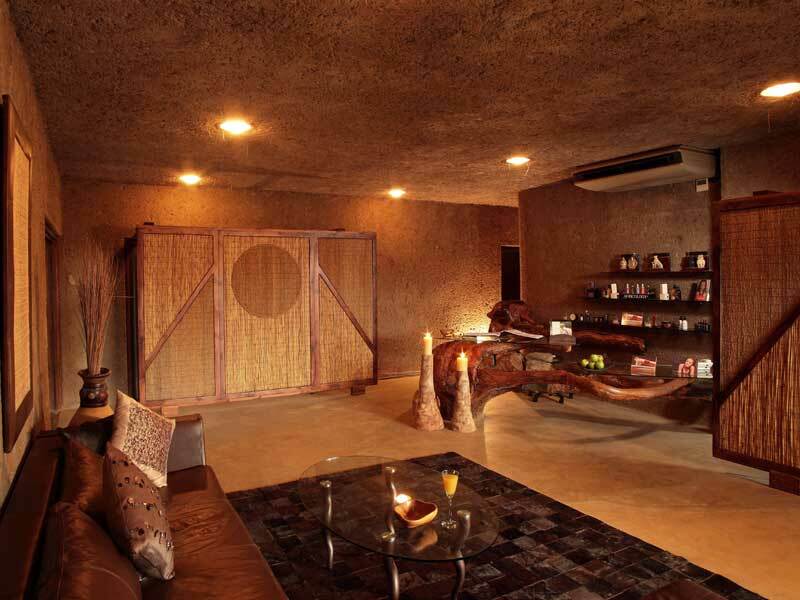 Earth Lodge has something therapeutic about it, even if it caused HRH a minor heart attack. Amani Spa at Earth Lodge is the most sophisticated spa operation in the South African wilderness. By “sophisticated”, I mean its expansive menu of treatments, although the spa itself wears the lodge’s earthy look and, like the suites, has glass-panelled roofs over which elephants tread. Accentuating this spa’s unique Africanness is its stock of new Terres d’Afrique products that incorporate the goodness of African flora. 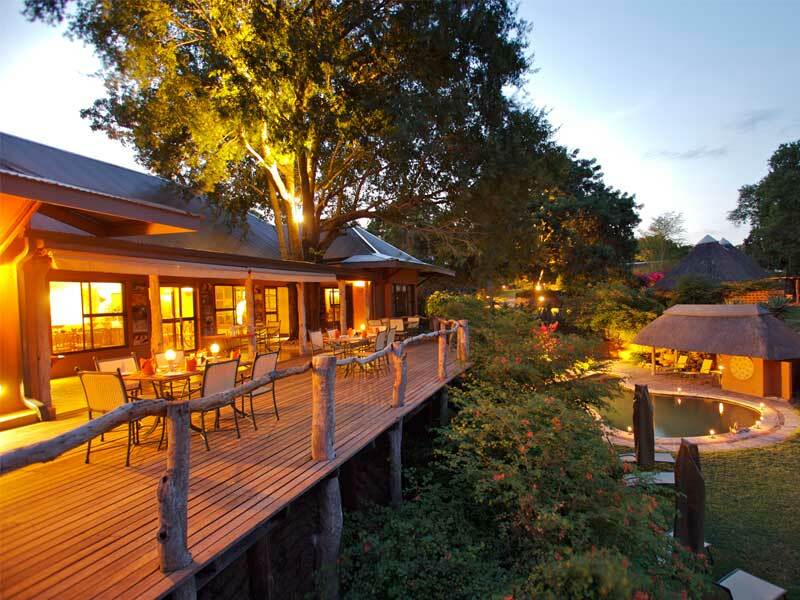 Otherwise, Joanne can do African rungu massages in-suite by your private pool that opens uninhibited into the wild. Nothing is quite like returning from a game-drive and having rungu sticks (traditional African wooden batons or throwing clubs) rolled over you. Joanne says this unique massage aids circulation, sensory nerve perception and lymph drainage. She further explains that “Rungu” is a Swahili word and that Kenya’s Maasai warriors used rungu sticks, of special symbolism and significance, in warfare and hunting. Ceremonial rungus may be elaborately carved. Indeed, ex-Kenyan President Moi swirled an elegant gold-tipped ivory rungu, which he would pound on a table in rage, sometimes shattering it. After the massage, Joanne leads me to my bathroom, where the bath foams and hot chocolate with molten marshmallows awaits. No time to wallow, I’m awaited for supper, a four-course meal that may happen in a magnificent wine cellar with artwork from driftwood. Or you can dine under an extraordinary twig chandelier on tables sunk in water. If wellness entails rejuvenation, then one feels young, even a kid again, when Nadia pops up under a tree whilst you’re on a game-drive, and stops the vehicle to offer you chocolate lollipops! This is after they’ve treated you to a profusion of pastries at afternoon tea before the afternoon game-drive. One morning, my unassuming guide, FW, who happens to be ex-President FW de Klerk’s grandson, takes me on a walking safari, where we learn about various plants. He says the “wilderness pharmacy” has cures for all. “Mental derangement too?” I ask hopefully about my principal affliction. “That’s incurable, D,” FW says apologetically. This exclusive retreat is about terraces encrusted into the wilderness, where birds flit, impala skip and leopards lurk (with any luck). The lodge itself is lavished with red carpets, exquisite antiques and artefacts from far-flung destinations, unobtrusively integrated into this wilderness setting. There’s a feel of regal poise. Wooden ways meander to suites so heartbreakingly beautiful. A four-poster bed all white and veiled in gossamer nets is inviting like a bride. Lose yourself in her swaddling embrace; until that damn phone rings at 5 a.m. to extract you from your bed for the morning game-drive. But not before there’s an assortment of cookies and coffee. 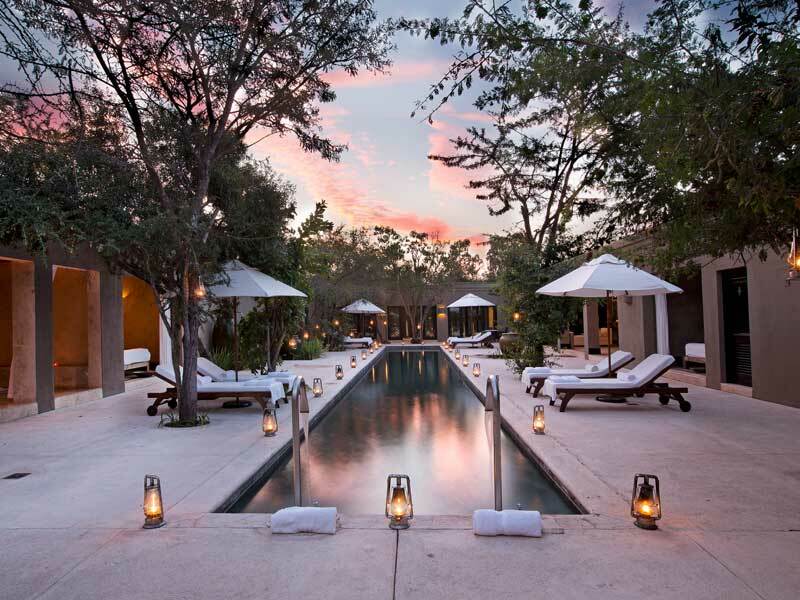 Royal Malewane is precisely the sort of place for people who are rather more interested in the spa and in being pampered than in game-drives. Mrs A, who is on the same game vehicle as me, discovers that I do yoga and wants us to meet for a yoga session in the spa. I say I’ve done yoga since I was born and have always done it solo and at 5.30 a.m. (except when on safari at 4.30 a.m. to be ready to leave by 5.30). Madame abandons the idea – anyway, she hasn’t brought along her private yoga instructor on safari, an oversight, pre-occupied as she was assembling an entire wardrobe of Ralph Lauren’s safari collection. She is somewhat scandalised at my safari dress code – I have embarked in my pyjamas, “Little satin and lace culottes, good heavens!” As Madame -VIP stalls our departure with an unreasonable number of cappuccinos, I say I hadn’t the time to shower after my 1-hour of yoga from 4.30-5.30 a.m., for we were expected to leave at 5.30. Now Madame did shower, in glass-encased bathrooms, and protests at the violation of her modesty by monkeys peering from pooled decks. When on a game-drive, our dear Mrs. A is next exposed to a naughty monkey spanking his monkey, so to speak, she almost collapses with horror and needs multiple sessions at the spa to revive her. So does Mr. A, whom the game-drives have quite exhausted. Mr. and Mrs. A prefer their cappuccinos, massages and spa sessions. 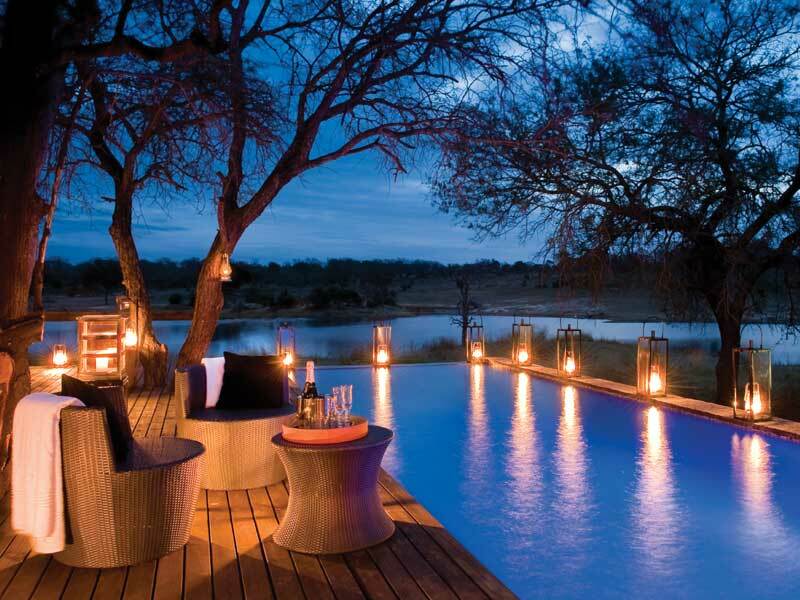 This lodge is for people who go on safaris to get pampered in the spa. Dinner table conversation is no tamer if you’re supping with high-profile lawyers who have Donald Trump for a client. The conversation is getting too hot. I must get away. “Does anyone know someone with a private jet?” I ask. “Yes, the President of the United States,” says my lawyer friend. For the not-so-well-connected, Cesszani does charters to Royal Malewane. I inform Andrew, my gracious GM and languidly passionate guide, that I’ve deplored the cheesy, greasy cuisine hitherto encountered in South Africa and have had especially unhappy experiences with women chefs. He is taciturn. We reach the exclusive-rent, intimate house where a bridge leads to warm interiors in African colours enlivened with orange. Carey, Andrew’s wife, is appositely caring. Philip butlers vigilantly. A chandelier like twirled reeds illumines an impressive dining table, signifying that tables will turn? If wellness is about healthy eating, then this isn’t the place for it! However, food made to order and served with feeling has wondrous effects on the heart and the head (although maybe not the waist), I shall soon discover. For with high tea on one of the villa’s outdoors terraces comes young chef Esmeralda, carrying flimsy cucumber and cream-cheese crackers and the best red velvet cake I’ve had. Her repertoire includes everything from tame salads to eccentrically extravagant breakfast offerings. In the sala flung over the river, she unleashes buxom scones, crumpets, puffs and pastries not for tea, but for breakfast. Or she’ll send you cream-cheese and chives scones during bush breakfasts on waterholes. After Esmeralda’s seven-course meal in the boma, including vichyssoise with curry ice cream, vanilla cauliflower purée and whacky melon risotto in soya sauce (stunning! ), I’ve acquired a ton. So I feast instead on in-house therapist Pedsy’s delicious massages with all-natural Africology products. Pedsy does outstanding massages, one of only two such in my South African experiences. She understands pressure and pressure points and sets up the massage bed in lovely open-air locations, all hung over the river, and including variants like the sala or pooled terrace or new tree-drenched deck featuring an outdoors bath. Wherever you choose to be treated, Pedsy’s massages with lashings of oil are just as wildly decadent; much healthier to have oil on your body than in it! Colonial chic colonnaded pavilions lead into interiors displaying hunting trophies, although we hear Mr Rattray has had to vault his old rhino horn collection for security reasons. This certainly happened after a forest warden and his wife were stabbed by poachers seeking keys to the safe where they thought rhino horns are stashed. But one’s mind is beguiled away from the menace of poaching, as one stands on this property’s terraces with stunner views. A sinuous river lazes like a dream, unless at dawn, high drama happens when a bushbuck is torn asunder by wild dogs. Elegant and enormous suites with verandas seem to stretch as long as the river, and have those same dreamy views and extensive pool-studded terraces – just where to relish a wilderness massage. 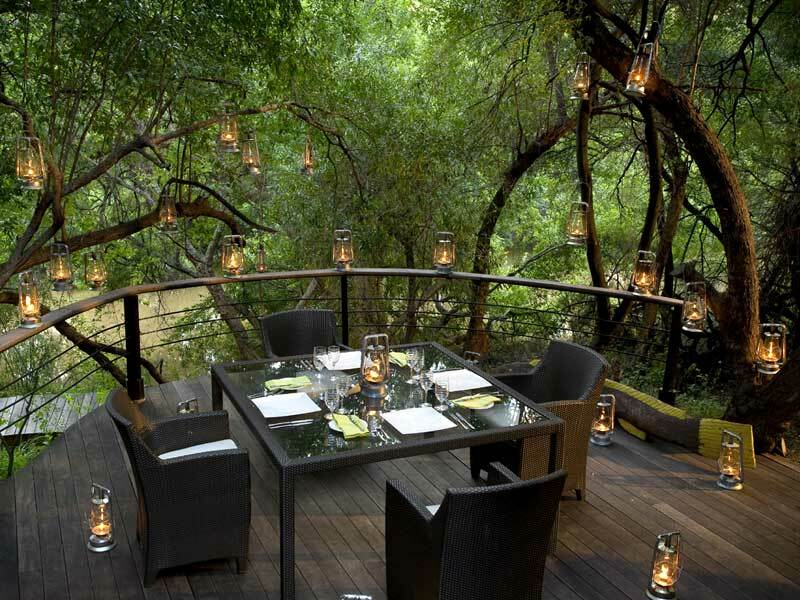 The best lunches with gorgeous salads and deliciously unfussy food enhance the wilderness wellness experience. They do have a spa, but more effective than the spa is this lodge’s location. It is the most mesmerising in all South Africa, serenely contouring a lake with a heap of hippos, crocodiles, lizards and incredible birds. In a concrete jungle that is the South African wilderness, its lodges made of cement and glass and materials don’t quite blend with the wilderness. Chitwa sets itself apart with its “Uniquely African” feel. There are abundant open spaces and thatch roofs and fabulous artwork chosen by the owner’s wife, an Italian artist. With smart lighting and decor, her waterfront terrace can transform at supper into something that could be on the French Riviera. Despite the hip feel, their emphatically eco-friendly efforts remind that this lodge is about well-being in the wilderness. Travel Tips: FedAir shuttles you directly and elegantly to your choice lodge. Excellent lounge facilities. Exceptional service.